Heat oven to 450°F. On cookie sheet, place pizza crust. In small bowl, stir taco sauce and chicken. Spread chicken mixture over pizza crust, leaving 1-inch border. Top with cheese. Bake 8 to 10 minutes or until cheese is melted and pizza is thoroughly heated. Drop sour cream by teaspoonfuls over pizza. Top with lettuce, tomato and tortilla chips. Cut into 8 wedges. 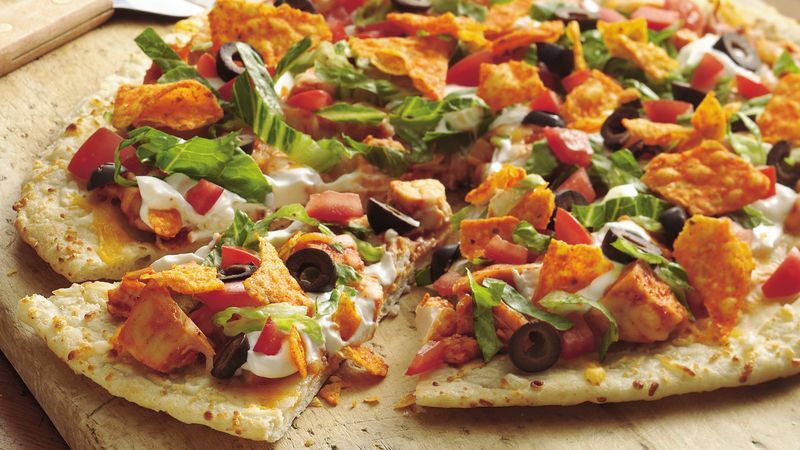 Make this pizza your own by topping it with your favorite taco toppers. Try sliced olives, chopped avocado, fresh cilantro or pickled jalapeño slices.